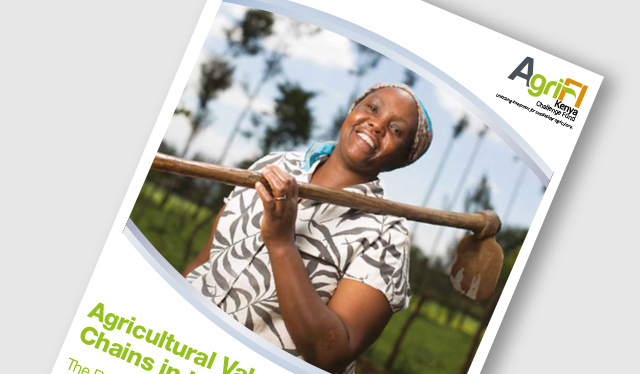 This report presents key findings on the role that ‘small and medium sized Agri-enterprises’ (SMEs) in Kenya play as market access agents for smallholder farmers/pastoralists (SHFs) and explores how SME-led interventions can be designed to sustainably benefit small-scale farmers/pastoralists. The potential for change through SMEs is high, but the change is also likely to be transformational for the underlying assumptions of, for example, who SHFs in Kenya are, and how their operations may evolve over the coming decades. SHF models are soon likely to look quite different in Kenya, even in the medium term, as women and youths follow income strategies determined largely by access to different types of assets. There is a growing trend at SME level to consider rural industrialisation to avoid the social and economic costs associated with Nairobi (and other large urban centres), and to secure their rural supply chains for the future. The study involved two layers of comprehensive fieldwork. The first explored Kenya’s agriculture sector from the vantage point of agribusiness SMEs – across numerous value chains (VCs) and counties. The second delved more deeply into important supply chains – from producer to off-taker to market, as well as the support functions in between. The findings should be read in the context of a focussed challenge fund, e.g. AgriFI Kenya Challenge Fund (or related), that looks to improve outcomes for SHFs by targeting growth in the SMEs that work with them through inclusive business models. The fieldwork was designed around testing a set of three hypotheses relating to commercial SME-SHF relationships – the nuanced understanding of which will inform effective and sustainable programmatic intervention. They focus broadly on cross-cutting objectives, variations in financial models, and employment dynamics.